When I was in third grade, our teacher assigned the class a "country of origin" project. I went home and began asking questions about my ancestors. My mom replied that our family was, as far as she knew, English with maybe a little Scottish in the mix. My dad said the same. To my eight-year-old ears, it was as if they said, "boringboringboringblahblahblah." So, I decided to make up some ancestors. And because the most glamorous girl in my class was Lydia with flowing auburn hair and sparkling green eyes, I decided that my ancestors would be, like hers, from Ireland, the land of rainbows and leprechauns, a place I believed to be truly magical. I did say that I was eight, right? The good news is that on Saint Patrick's Day, everyone is Irish. 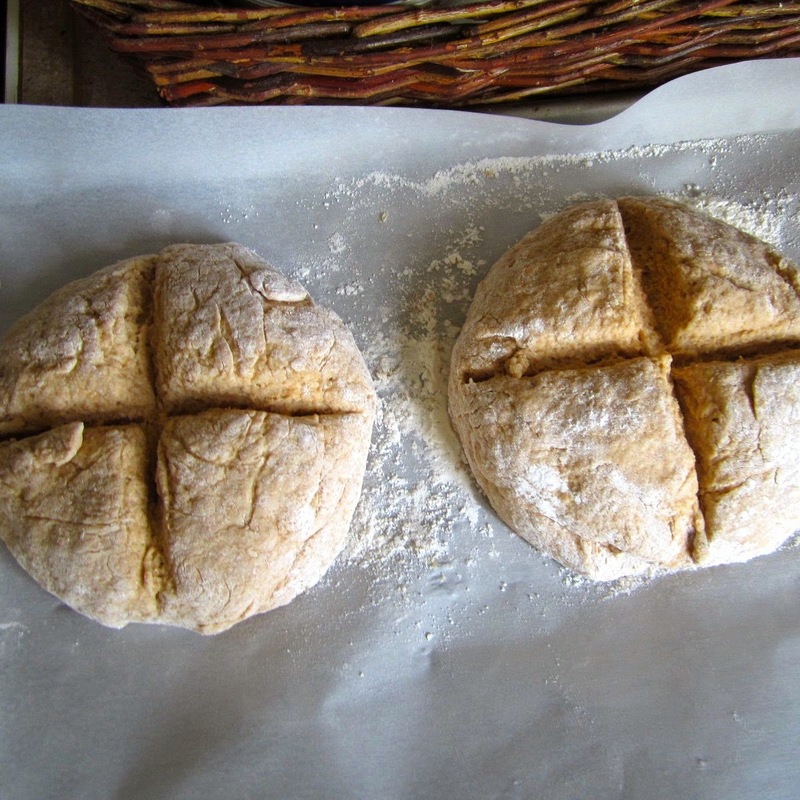 And so, to add a little magic to this not-quite-Spring time of year, I've planned an Irish dinner. 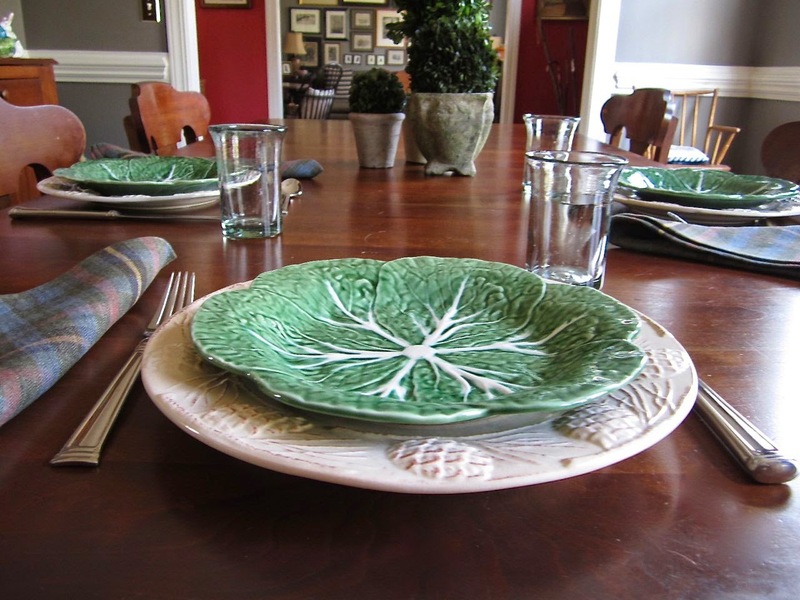 Despite my once yearning to be Irish, turns out I don't have a lot of green in the tableware department. 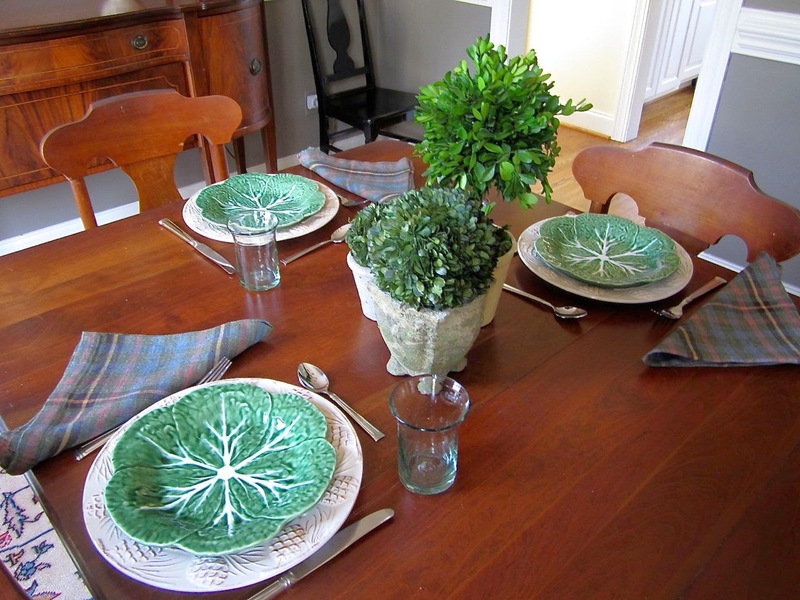 I made do with these cabbage plates, green bottle tumblers, and my favorite Belgian linen napkins with a faded green, blue, and red plaid. For a weeknight centerpiece, I added a few preserved boxwood topiaries. 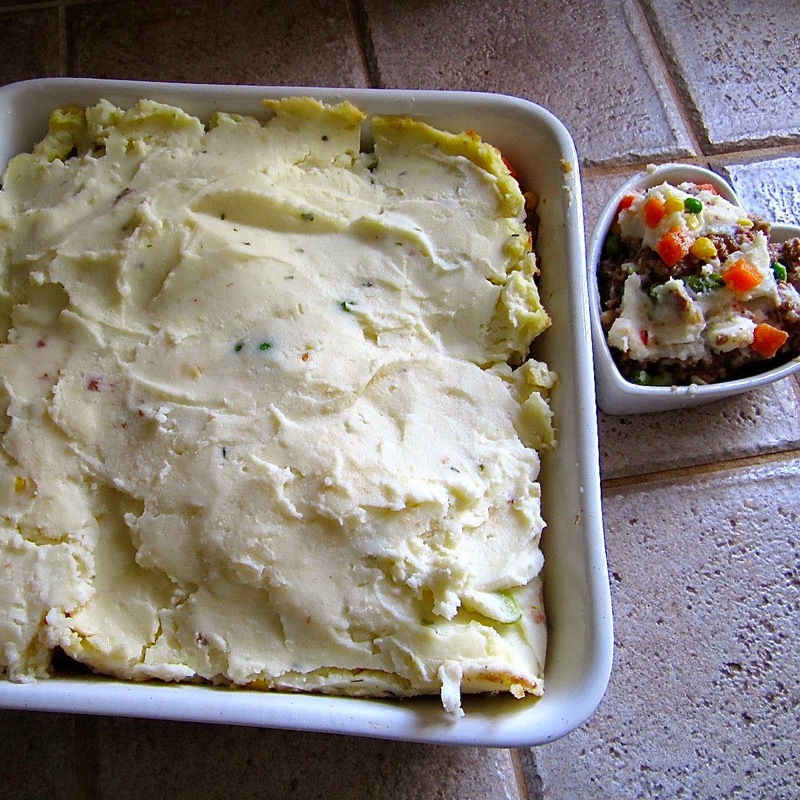 When both boys were living at home, Shepherd's Pie was a favorite dinner during cold weather months. To make it an even faster, easier recipe I substituted a couple of convenience products in order to get a hearty dinner on the table really quickly after a long work day. Preheat the oven to 350 degrees and lightly spray a 9 x 9 baking dish. Brown the ground beef and drain off the fat. Return beef to the skillet, and to thicken, sprinkle with flour, then pour over soup and stir gently. Let meat simmer for two or three minutes before layering in the baking dish. Next add the frozen vegetables, and top with mashed potatoes. Bake covered for 30 minutes, then remove lid (or foil) and top with cheddar cheese, if desired. Return to oven for another five minutes. This dish yields 6 to 8 servings. I am not a bread baker. Most of my efforts, except for biscuits and rolls, have not ended well. On more than one occasion I have had to throw out the bread and the pan it was baked in. I wish I was kidding. My hopes weren't all that high for this bread, but since it didn't require yeast to rise, I figured I might have a shot. It turned out great. 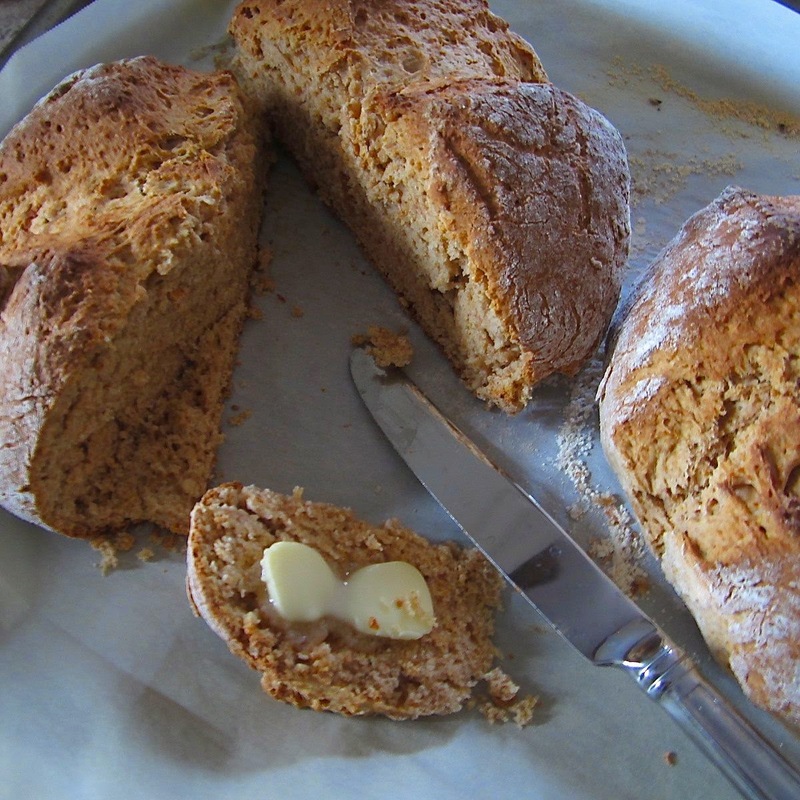 It's a nice, peasant bread--the texture was even, and the bread is slightly sweet. I found the recipe on epicurious, and I made only the slightest modifications. Preheat the oven to 425 degrees. Line a large rimmed baking sheet with parchment paper. 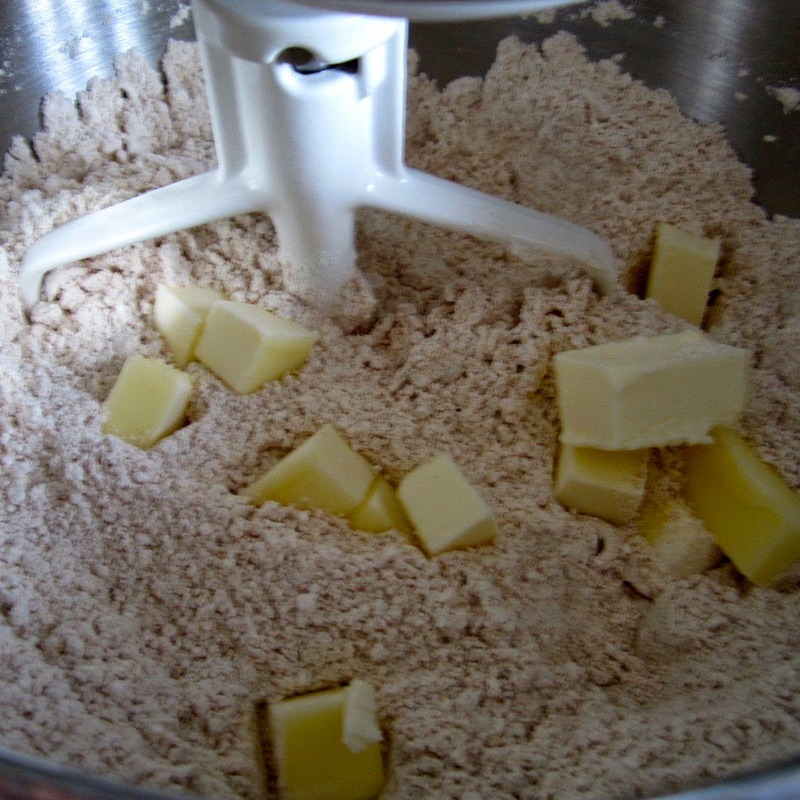 Mix together the dry ingredients on the lowest speed of your mixer. Add the cubes of butter and continue mixing at a low speed. Pour the buttermilk in a very slow, thin, steady stream. When the milk is all added, turn off the mixer. The dough will be shaggy. 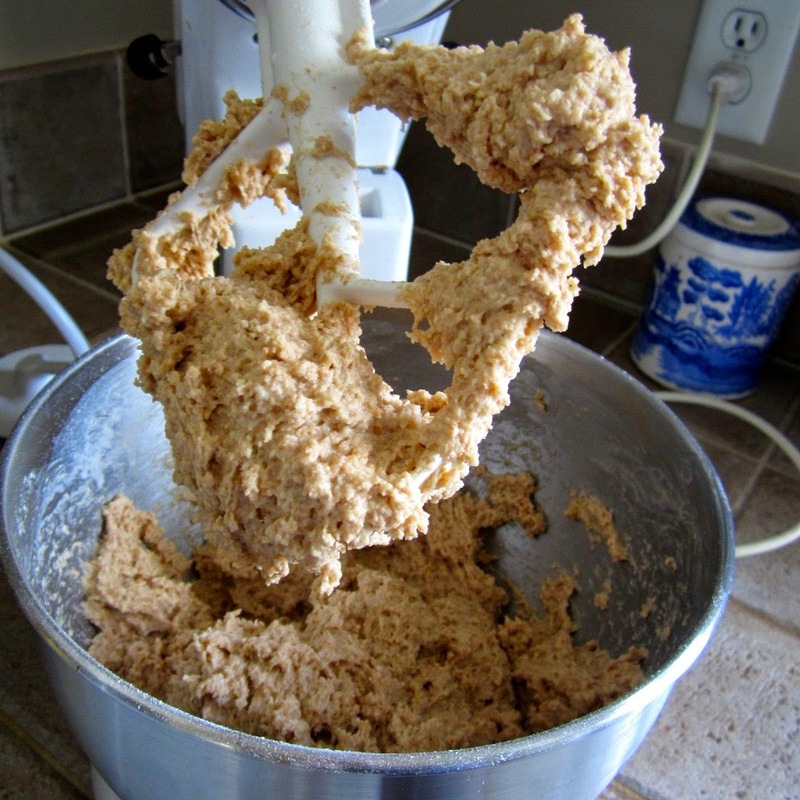 Remove half the dough from the mixing bowl and turn out onto a floured surface. (I used the parchment paper-lined baking sheet.) Gently knead the dough about four or five turns and shape the dough into a round. Do the same with the second half of the dough. Cut a deep X or cross into the top of the rounds. This is known as "blessing the bread." Bake for 40 minutes or until the round sounds hollow when tapped. Serve warm with butter or room temperature. These are Little's absolute favorite. You'll need the ingredients for your go-to brownie recipe or boxed mix and a four-ounce package of Andes Mints, unwrapped and chopped coarsely. Simply prepare your favorite brownie recipe or boxed mix according to directions. (I think the Baker's One Bowl Brownie recipe is the best, although I cut the sugar by a half cup.) Then add the mints and stir in gently. Bake as usual. Allow brownies to cool completely before cutting and serving. Although it's not exactly healthful enough to be in our "regular supper rotation," this simple St. Patrick's Day dinner is great for a fun, family supper or a casual dinner party. I hope you enjoy it! Are you doing anything special to celebrate St. Patrick's Day? Am firmly committed to the Scottish fraction of my heritage, so, no Irish celebrations here:). But, I love your table.